E-Athletes have as good a reason to enter the country as any kind of player. 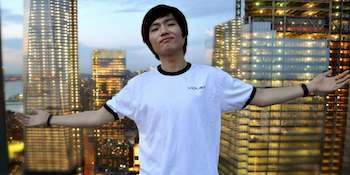 Korean Starcraft II player Kim "Violet" Dong Hwan has been granted a five-year visa to enter and reside in the United States as a professional athlete, the first person to receive an official visa for playing Starcraft II professionally. The decision to offer e-athletes "P-1A" visas, the same visas offered to professional athletes, came five months ago, after Canadian League of Legends pro Danny "Shiphtur" Le petitioned and received special permission to enter the U.S. so he could receive a salary for his role on Team Coast Gaming. Though Hwan's case was not a special exception, like Le he needed support from a US-based organization, who lobbied government officials on his behalf: Where Le had the support of LoL developer Riot Games, Hwan had talent agency Cyber Solution Agency (CSA). "It was do or die for [Kim]," CSA's Andrew Tomlinson told The Daily Dot "He either got the visa or entered the Korean military." Hwan repeatedly applied for student visas to study English: He was denied three consecutive times and was told that he would be put the "no fly" list and permanently banned from entering the US if he attempted to enter the country without permission. Le says he would like to eventually apply for U.S. citizenship. You can get a more detailed account of Kim Dong Hwan's road to recognition as a professional athlete at The Daily Dot.